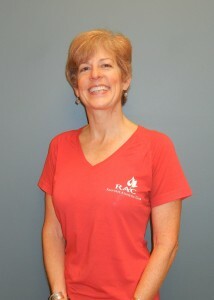 Sandy Ernst-Aldern may just be one of our most prized possessions as a RAC team member. A long standing presence here at Raintree Athletic Club (formerly The Pulse), Sandy can be seen working with clients on the weight room floor, teaching cycling class, in Studio 1 leading Core class, or chatting with members in our lobby with her infectious laugh filling the air. She is a pleasure to be around and we thought, why not get to know a little more about this wonderful woman? Q. How did you get involved with personal training? A. I had been a Spinning and Core instructor for many years, and was very interested in how the body works. Muscle structure and function are AMAZING! I also had a few trainers at the gym who I would watch while they were working with their clients. The training they gave and the relationships they built were fascinating to me. In early 2008 I completed my education to become certified as a personal trainer. A. It’s actually twofold. I love helping people figure out how to increase their healthiness. A strong body increases a person’s abilities in everyday life, as well as increases brain function. Overcoming mental and physical obstacles to exercise (knee replacements, back problems, fear from inexperience, etc) brings me joy. The confidence and freedom a healthy body gives is undeniable! The relationships that I have built while doing my job have been an enormous blessing. Getting to know people at such a personal level allows me to assist them in more than just physical ways. My clients have all become my close friends, and I love that! Q. What is one of your favorite success stories from your time here at the RAC? A. To me, in this venue, success is continual. Every time a client shows up, there is success. Q. Is there something you have learned from your clients? A. Holy cow, how do I count the thousands of things I have learned?!? One of the biggest lessons I have learned is that we should never judge a book by its cover. It seems so simple, but it is so very powerful! Everyone has a special story, a unique life, and a history of successes and disappointments. NEVER judge a book by its cover. Q. What do you do to keep things fresh, and not so monotonous with your clients? A. One of my goals is to change up workouts every time. I believe it keeps the body changing AND it keeps people from being bored with training. I make up different exercises all the time to keep things interesting. My clients often ask, “How did you come up with this one?! ?”, a question I love hearing! Q. When you are not training, what do you like to do with your time? A. I love remodeling. If I didn’t train, I would remodel homes. I begin with creative ideas for a space, then make a design. I have learned electrical, tiling (my fave), some plumbing (ick), cabinetry, trimwork, and the like (drywall? Hire that out!). To have a problem and have to figure out a solution makes me very excited! Q. If you were given a free airline ticket anywhere in the world, where would you go? A. I will have climbed some 14-ers, and will have a remodeling project going on somewhere! I have been training with Sandy off and on since December of 2009. The "off" times are due to me and my issues only. She's knows me and my body pretty well, and always welcomes me back with a huge hug and lots of compassion. Love you bunches, Sandy.